Senator Antonio Trillanes produced an affidavit during a face-off with the camp of leading presidential candidate Rodrigo Duterte at BPI Julia Vargas branch. The vice presidential aspirant earlier said that the Davao City mayor has a P211 million deposit in his BPI account. Duterte denied the allegation and dared Trillanes to file an affidavit stating the source of his information and when he received it. On Monday, Trillanes gave Duterte's representative, Atty. 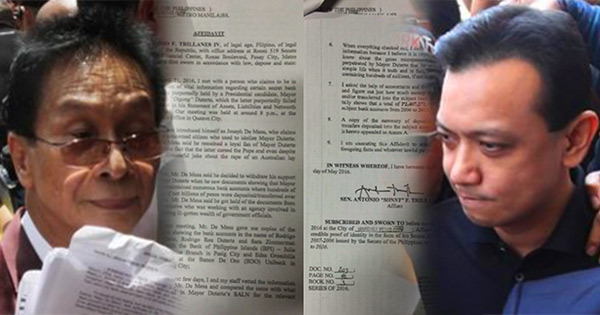 Sal Panelo, an affidavit containing the name of his informant and how he obtained the documents regarding Duterte's bank account. Trillanes said in his signed affidavit that his source is a certain Joseph De Mesa whom he met on April 21. The informant, he said, was a Duterte supporter who withdrew support after seeing documents related to the mayor's alleged ill-gotten wealth. The senator called Duterte a coward for failing to issue a waiver and for declining to provide the transaction history of his bank account even after he provided an affidavit. Panelo, meanwhile, asked for a certification from the officers of the Bank of the Philippine Islands to disclose that Duterte's account does not contain "P211 million whether singly, collectively or cummulatively." Due to certain protocols, however, officers of the bank asked for seven working days to respond to their formal request, he said. Panelo downplayed the senator's affidavit. The lawyer told reporters that he did not get an answer from Trillanes when asked if his source was real. Panelo: Tinanong ko ang BPI, "Batay ba sa record ninyo, mayroon bang 200-M si Duterte sa account"? Sagot ng BPI, "wala po." Panelo: Sinabi ng BPI na walang 211-M si Duterte. Then, humingi ako ng certification. Sabi nila, in 7 days daw.